What’s something everybody should be able to bake? – Pound Cake! Now, I’m in no way, shape or form a good baker. I love cooking, but baking is so not my thing! But I decided that I would face my fears on this fine Friday and try my hand at baking something… something extremely simple. 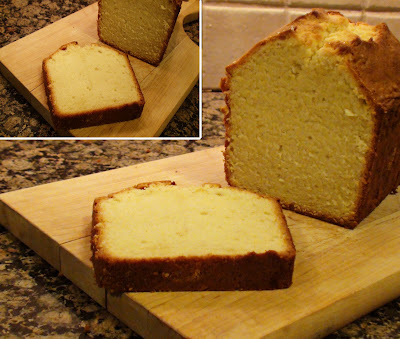 So I was browsing around Martha Stewart’s website and I asked myself “What’s something that everybody should be able to bake?” and then it popped up, like a sign from God; a classic pound cake. Mix butter, granulated sugar, and vanilla together in a bowl. Beating until pale and fluffy (around 3-5 minutes.) Next, add the eggs, one at a time, beating until combined after each addition. Slowly mix in the flour mixture until it’s just combined. Spoon batter into a pan and bake for 50 to 55 minutes, until the cake is golden and when you insert a cake tester it comes out clean. Let it cool for 10 to 15 minutes and then remove from the pan. I have to say it was quite the delicious cake, perfect for what I would imagine to be served at tea time in England! Looks delicious!!! Must try it!!! Excellent idea to cut down on the salt!! !